Sometimes when researching a family’s history, you come across some sad tales but, somehow, people survive and thrive against the odds. 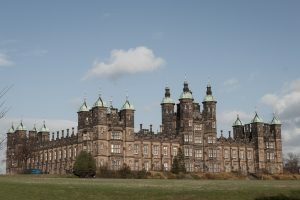 One such story was that of a young deaf and dumb girl, admitted to Donaldson’s Hospital in Edinburgh in August 1879. Her entry in the admission register states that she had an older sister and a younger brother, that her mother was dead and her father was serving a 12 month prison sentence. Enough there to intrigue anyone, so I researched the family and what follows is their story – though the names have been changed. Her father, Sidney, came from Edinburgh and her mother, Lucy, from London; they were also deaf and dumb and married, in London, in 1867. They had 3 children; the two oldest, both girls, were born in Edinburgh – Amanda in 1868 and Wendy in 1872 – and the youngest, a boy called Thomas, was born in the Pancras district of London in September 1874. Around the time of Thomas’ birth both the sisters appear in the St. Pancras workhouse register, though they were only there for a couple of weeks. In March 1879, father Sidney appeared at the Old Bailey in London charged with obtaining money by false pretences from a Mrs Gladstone (wife of William Gladstone, former Prime Minister) and was sentenced to 12 months hard labour the following month. Unfortunately, mother Lucy died in London that same month, April 1879. Thomas is admitted, age 4, to the workhouse at Holborn in London in June 1879 and a week later is sent to Mitcham School and Wendy is elected to attend Donaldson’s later that year. Thomas is discharged from Mitcham into his father’s care a year later, presumably after he was released from prison. By the time of the 1881 census the family are all back in Scotland – the eldest, Amanda is working as a domestic servant in Portobello, near Edinburgh, Wendy is recorded with her father, living with her paternal grand-parents in Edinburgh and Thomas is listed amongst a group of other “boarders” in a house at 10 & 11 MacKenzie Place, Edinburgh. This latter was a home for destitute children set up by Miss Emma Stirling (more of whom later). Sidney seems to have picked himself up for a while, but then things just go from bad to worse – in September 1882 he is sentenced to 60 days in prison for theft; in April 1885 – 7 months; August 1886 – 60 days; October 1886 – 30 days; then he is in court again in April 1888, March 1889, September 1889 and in December 1890 is sentenced to 7 months in prison, confirmed by the 1891 Census where he is listed in Barlinnie Prison, Glasgow. His final recorded court appearance is in June 1892 when he is convicted of illegal betting. There was talk of him going to America in 1889, but that obviously did not happen. Why America? Because that is where all his children ended up – but they did not get there easily. 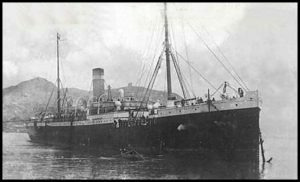 All three children are included in the passenger list of the SS Carthaginian sailing from Liverpool and arriving in Halifax, Nova Scotia in September 1886. Amanda, shown as age 21, though is in fact 18, and Wendy, age 14, appear to have travelled together, but Thomas, age 12, was with a group of other children who it is believed were being taken to Hillfoot Farm in Nova Scotia by Miss Stirling. Wendy was the first to travel to Boston, Massachusetts in 1889 at the age of 16. She married in 1897, had 2 children and at least 4 grand-children. Wendy died in 1953. In her petition for US naturalization in 1925, Amanda states that she was in the USA in 1889, possibly she travelled there with her sister though then appears to have returned to Scotland. She arrived back in Boston in 1904, stating she had been in Dundee and is listed in the 1910 & 1920 censuses in Boston before she became a naturalised citizen in 1925, listing herself as unmarried and a seamstress. When Thomas filed for his naturalisation as a shipping clerk in Boston, he states that arrived in the country in 1891, age 17, from Nova Scotia. All three children – against the odds – made something of their lives.